That’s right – it’s a delta robot, tasked with the job of sorting golf balls by color. A Pixy2 object tracking camera is used to survey the table, with the delta arms twitching around to allow the camera to get an unobstructed view. Once the position of the balls is known, a bubble sort is run and the balls rearranged into their correct color order. [Anthony] readily admits the bubble sort is very inefficient at this task; it was an intentional choice so it could be later compared with other sorting methods. [Anthony] also goes into detail, sharing the development process of the suction gripper as well as discussing damping methods to reduce noise. Delta machines are always fun to watch, and are a good choice for sorting machines. We’ve seen some really tiny ones, too. Video after the break. 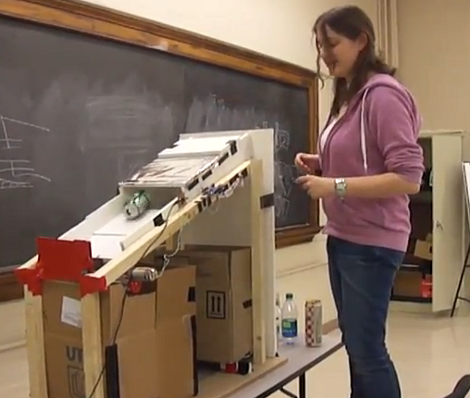 [Yuhin Wu] wrote in to let us know about the Automated Recycling Sorter that was built with a group of classmates at the University of Toronto. They entered it the school’s student design contest and we’re happy to report that it took first place. The angled sled has been designed to separate glass, plastic, and metal containers. The first sorting happens at the intake area. A set of moment arms are used to weed out the glass bottles. Since there are several of them in a row, a larger and heavier plastic container will not be falsely sorted and the same goes for smaller glass bottles. With the glass out of the mix the team goes on to separate metal and plastic. An Arduino was used for this purpose. It senses an electrical disturbance caused by a metal can passing through the chute and actuates a trap door to sort it. Plastic has no effect on this sensor and slides past the trap to its own sorting bin. Don’t miss both demo videos which we’ve included after the break. 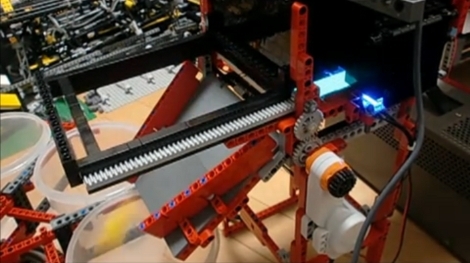 Turn your volume down and take a look at the brick sorting robot in the video above. It’s built using LEGO and powered by four different NXT modules. It sorts differently colored bricks on the intake conveyor and places them on three output conveyors. The build is solid and was [Chris Shepherd’s] impetus for starting a blog. We appreciate the pneumatic tricks that he detailed in some of his earlier posts such as a compressor, pressure switch, and air tank system. His advice is “build, build, build” and that’s what you’d have to do to perfect a monster of this size and scope.